The cleansing and healing properties of BlephroClear blepharitis treatment will provide immediate relief by gently cleaning the stickiness and flaking on your eyelids. With continued use, your eyelids and lashes will be looking and feeling radiant and healthy once more. 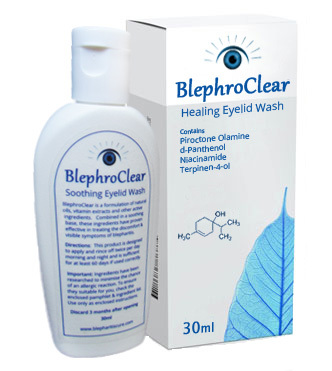 BlephroClear blepharitis treatment, is a healing eyelid and eyelash wash that eliminates the embarrassing and uncomfortable symptoms of blepharitis. Each bottle contains 30ml which when used correctly is sufficient for at least 60 days. Great care has been taken to ensure that the ingredients and their respective proportions have been blended to provide maximum effectiveness and benefits while also minimizing potential allergic responses. However, there is always someone out there who is allergic to something. Accordingly please check the list below. Also, please check the instructions for use when you receive your BlephroClear. Your secure purchase will be through Stripe and your credit card receipt will be issued in the name BlephroClear. Hello, I’m, a programmer and trader. Five years ago blepharitis nearly ended my career and badly affected my social life. Many products are developed by large companies driven only by profit. I developed BlephroClear to get rid of my own blepharitis after trying so many things that didn’t work and being told it was incurable. It took two years of research and trials but its worked for me and many other people that have used it . Blepharitis really affected my quality of life so I am passionate about providing it to other sufferers for as low a cost as possible so they also can be free of blepharitis. Friendly, knowledgeable and understanding support. Treatment for less than AUD .65c per day. Always fresh product: We make regular small batches. The bottom line is we love our customers, and our customers love the results! Your satisfaction and successful use of Blephroclear is important to me. If you are not satisfied that BlephroClear is helping you please contact me within 40 days of receipt of your purchase for return instructions. You can then send the remaining product back for a 100% refund. Most orders are shipped within 24-48 hrs for your convenience and maximum efficiency. Within Australia the shipping charge is $4.50 and your product will arrive within 7 to 10 Business Days. All International (Non-Australian) orders are shipped via standard international mail and incur a $8.50 shipping charge. Delivery may take 2-3 weeks depending upon what country you live in. We offer Expedited Shipping for $27.95 Delivery around 10 days. We have a 100% Satisfaction guarantee or your money back. Please see returns instructions and contact us for return requests.